October 4th is the Feast Day of St. Francis. 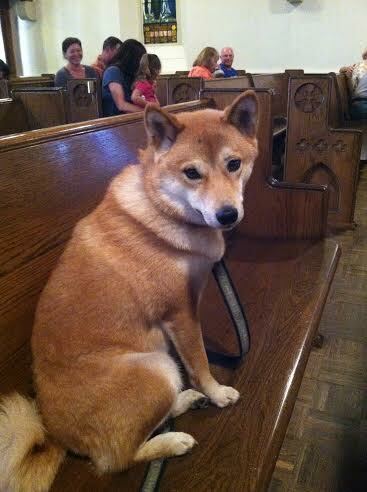 So at church this evening, we had the annual “Blessing of the Animals” service. It’s one of the best evenings of the year, where people are invited to bring their pets, or whatever animals they choose, into the sanctuary to have them blessed by the priest. It’s always exciting to see if anything exotic shows up. Most years, among the cats and dogs, there are at least several chickens, and occasionally you get rabbits or a snake (not sure what kind of theological statement that makes–to bless a snake…?). Someone told me once that where they used to live in New York City, every year a few animals from the Brooklyn Zoo would be chosen to come to the cathedral and receive a blessing. Today’s service was enjoyable as always, but it was also bittersweet for me. We had built the tradition of taking our dog to be blessed every year that we had her. A year ago this weekend was the last time my husband let me see our dog, and I took her to have her final blessing here in Boise. I felt sad at the time, knowing that this would most likely be the last time I’d get to worship with her in church, but also I was still not wanting to believe it was true. She was like our child–we loved her like she was our baby when we brought her home at seven weeks old. Her birthday is October 21st, so this is a sad month of Penny anniversaries for me. She was so smart, beautiful, and had such personality (I always half-jokingly said she took after me the most…). People were drawn to her, but she was a little prickly and definitely needed her alone time. It was often frustrating, because she was so adorable and had the thickest, softest red coat, but she wasn’t very physically affectionate and didn’t like to be pet much. She picked and chose who she warmed up to, and she was definitely stubborn–if she didn’t want to do something, there was no way to force her into it. She was a mountain girl too–she was never happier (and neither was I) than when our little family was up hiking in the mountains or snowshoeing in the woods. Those were the absolute best times for us. It’s incredible to see a creature in its natural habitat–the way they just completely know how to be and what to do when they are in their element. That’s how Penny was in the mountains, and especially in snow. She was so funny to watch–she would run and play and bound and leap through the drifts of snow, and just roll around and get all covered in it. Her breed is the most ancient of dog breeds and has the highest percentage of DNA that is identical to that of wild wolves. She was wild at her core, indeed, just like her mama. We used to joke about how crazy we were to have invited a little wild animal to come and live with us, but we still loved her. I admit, there were many times where I felt frustrated with Penny. Like I said, she and I both needed our alone time, and it was hard for me to always have the distraction of her scratching at the door and wanting to go in and out, in and out, in and out…… There were times when I felt angry with her and wasn’t as loving as I should have been, and I regret that. But honestly, what parent doesn’t get frustrated with their children and want a break from them now and again? Not that that makes it right, but unfortunately, it’s an eventual part of relationships. It doesn’t mean I didn’t love her, and it still hurts that I never got to see her to say my good-byes. I still miss the softness of her ears, the smell of her forehead, and giving her kisses on the top of her snout. There was a lady sitting a few pews ahead of me in church tonight who had a dog that looked very similar to my Penny-Lou. It was sad to see the resemblance as it reminded me of my long lost doggie. But I tried to think with gratitude about the time I had with her, and the love that she once brought into my life. For a dog who wasn’t very affectionate, there were times when she licked the tears from my face and understood when I was having a hard time. I still miss her every day, and I think of her whenever I walk by doggies on their evening walks with their owners around my neighborhood park. I think of her and send her my love whenever I pet another dog. After church, I found myself meandering on a walk, and navigated toward the foothills trail that used to be our daily walk with Penny. My husband was almost always the one who took her because he got home from school early and would take her out right then. But usually on the weekends we would all walk up the hill together in the morning or the afternoon. My friend Norm talks about the “geography of grief”–how certain physical places hold the memories we shared there with our loved ones, and how it can be painful, if not impossible, to return to those places for the visceral grief it evokes. I haven’t walked that trail for many, many months now, but it was good for me to walk it tonight. To give thanks for all the walks I had there with my dog and my husband; for the beauty of the place; for the blessing to be able-bodied to take such a walk. But now I have a new evening routine–I walk around Cassia Park several times each evening, just a few blocks from my house. I’m getting to know some of the regulars–dogs and humans alike. Just yesterday I met the most adorable German Shepherd puppy–8 weeks old and just absolutely the most precious thing you’ve ever seen. His ears stuck straight up and actually touched in between them at the tips. He is going to be one beautiful dog when he’s all grown up. I pet him for about ten minutes and he just flopped and rolled around and leaned into my hands. When I was petting his back, he lifted his head up backwards and gave me a few little kisses on my chin. So sweet. Nothing like puppy love. A few months ago I almost got another dog just like my Penny. He lived in Colorado and was listed on a rescue site, not because he was troubled or in danger, but because his parents were having a baby (a human one, that is) and knew they wouldn’t have the time to spend with him that he needed. The deal was pretty much sealed and I was going to pick him up Labor Day weekend, but the family decided to give him to another family who lived closer by. I was very disappointed, but I trust that it was not meant to be for now. I miss the companionship of having a little creature sleeping on the floor in the living room (and in my bed occasionally…) and maybe I will know that again one day. Until now, I’ll just appreciate the neighbor dogs that I greet in the park, and hope that another doggie comes into my life when I have the capacity both to receive his love and extend my love to him. Mama will always love you. While in Namibia this past winter I was trying to explain to a man who lives there in a small dirt floor hut how my dog sleeps in my bed with me. He just couldn’t understand how I would let such a creature into my bed.